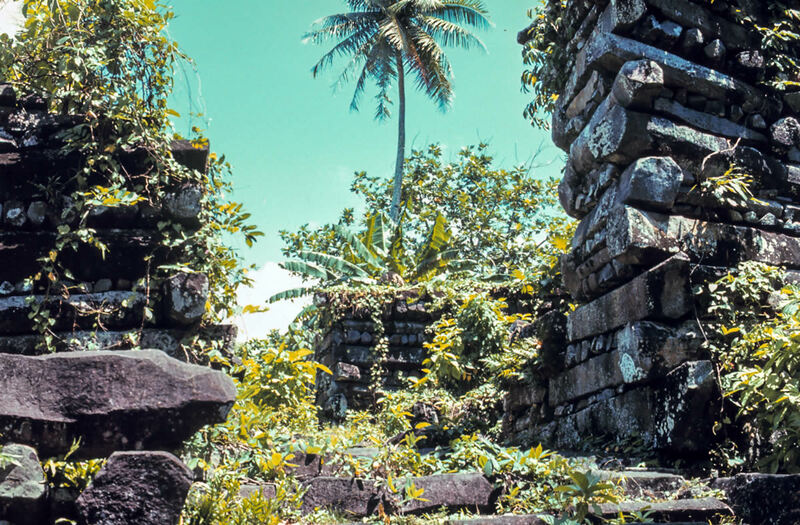 About 3000 miles southwest of Hawaii, near the equator, lies the island of Pohnpei and one of the world’s most mysterious archaeological enigmas, Nan Madol. 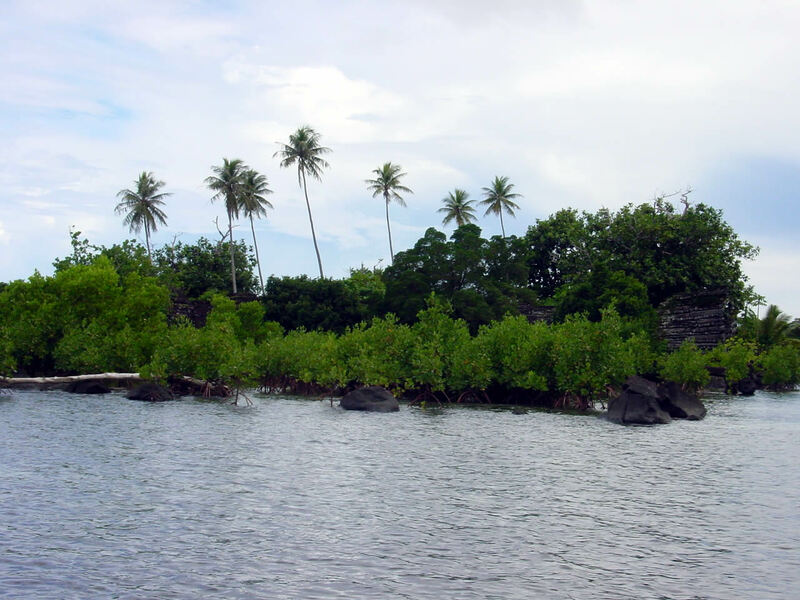 Pohnpei is one of the Senyavin Islands which are part of the Caroline Islands group. It belongs to Pohnpei State, one of the four states in the Federated States of Micronesia (FSM). The Federated States of Micronesia is an independent sovereign island nation and a United States associated state. It includes Yap, Chuuk, Pohnpei and Kosrae. 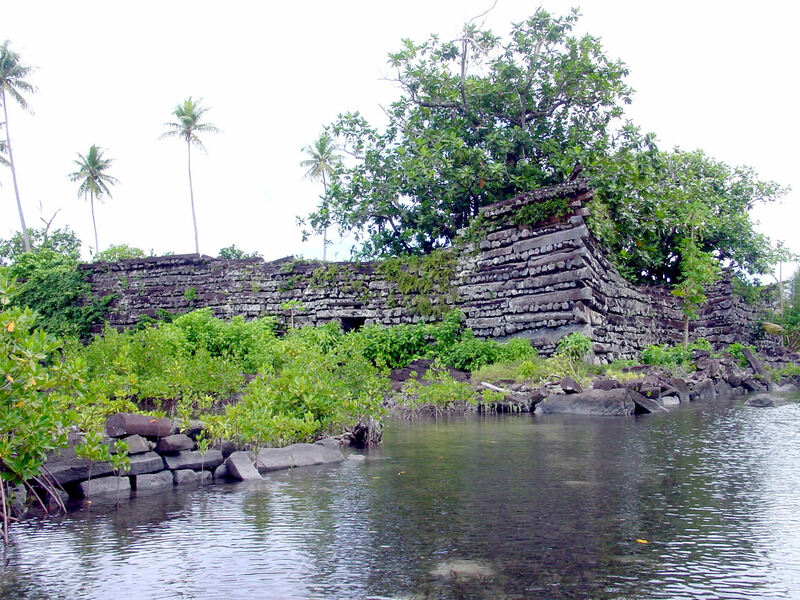 Nan Madol was already long abandoned when the first Europeans saw it in the 1800s. 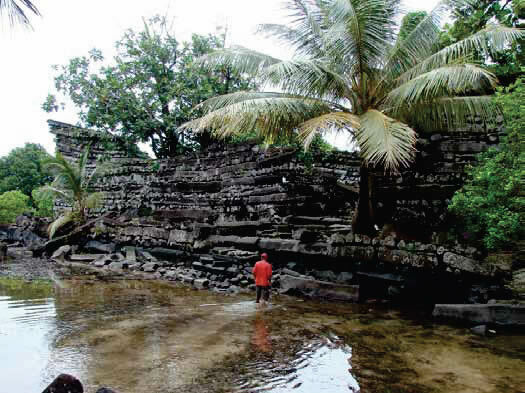 Nan Madol had been mysteriously abandoned about a century before. Early missionaries sent back reports of the mysterious ruins by the 1850s. Researchers and explorers followed. They recorded and mapped (and looted) the site. 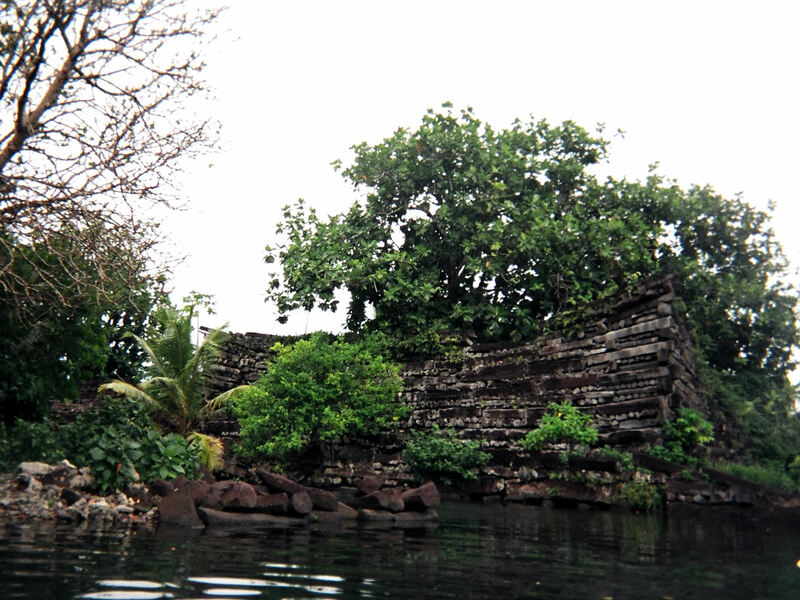 The city or Nan Madol is built in a lagoon. It consists of 99 small artificial islands linked by a network of canals. Massive stone structures, up to 23’ tall, were built on the islets. They are enclosed by walls constructed of thousands of basalt “logs,“ naturally prism-shaped columns like the ones at Giant’s Causeway in Ireland, each having between five and eight sides, up to 18 feet long and weighing more than five tons. The whole thing is surrounded on three sides by a massive sea wall. “The Nan Madol settlement complex is built on artificial islets extending across a shallow reef platform within the fringing reef of the adjacent small island of Temwen on the south-east coast of Pohnpei. 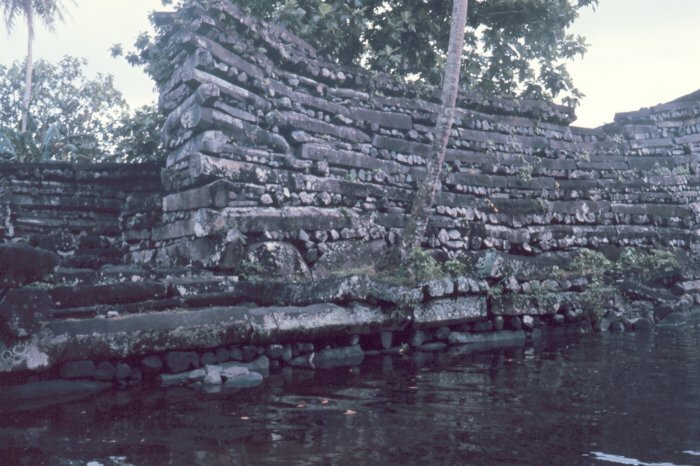 Navigable tidal canals were created between the islets which were constructed with walls of basalt and coral boulders and filled with coral rubble from the reef and soil from Temwen Island. Erected on top of the islets were monumental stone structures, some with walls 6-7 metres high. Formed by lengths of prismatic/columnar basalt laid in header and stretcher patterns, the walls surround tombs, residential domains, and sites for sacred and ceremonial activities. Now a tourist trail has been constructed. An elevated causeways runs from the land entrance on Temwen Island to Nandowas. Massive walls, some as long as a city block, appear first. 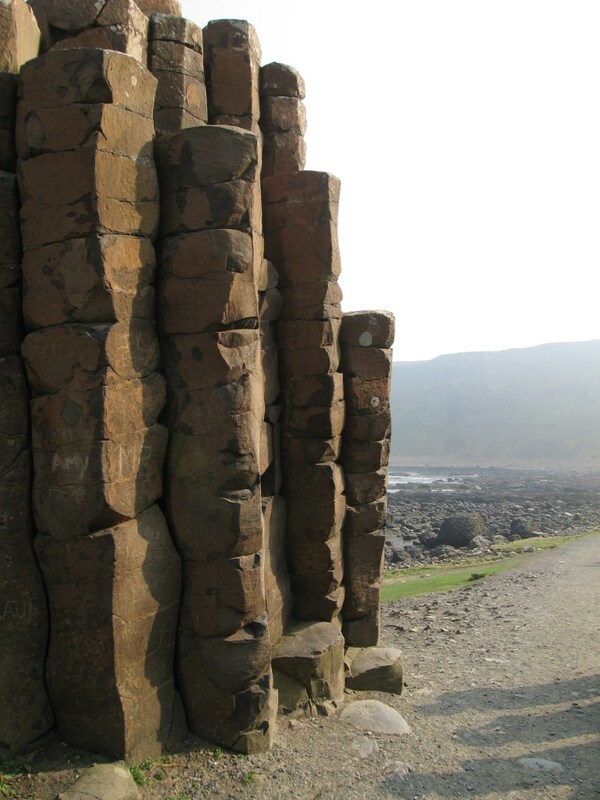 These walls were built of huge basalt columns stacked crisscross. The walls are 10 to 15 feet thick and 25 to 30 feet high. Higher towers reach into the sky. Nan Madol means “places in between” or “spaces between.” It is thought to refer to the canals and waterways that run through the ruins. Nan Madol was designed for water traffic. The canals are as wide as four-lane highways. They are quite shallow. Even at high tide, they are only waist-deep with a coral bottom. Perhaps this was to prevent enemy ships from making it into the city. Once you get to the island, you can explore this maze of man-made islets and canals built a thousand years ago on this shallow reef on the edge of the Micronesian island of Pohnpei. There are 99 man-made islets. Each built in various shapes and sizes with a different purpose; residential food preparation, canoe making, coconut oil preparation and ceremonial dancing. Fifty eight of the small islands were dedicated to the mortuary. 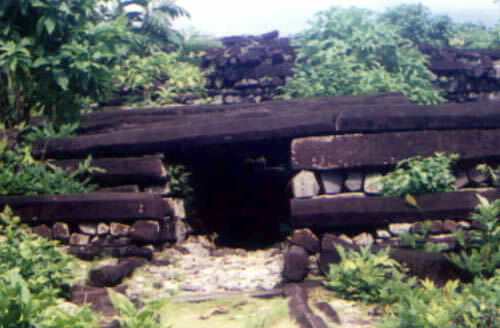 The royal mortuary islet of Nandauwas has walls 18 to 25 feet high. There is a large courtyard guarding a stone vault. Nearby is an underground passage with a narrow opening. This small, dark underground chamber was likely a prison. The door is a two-ton stone. 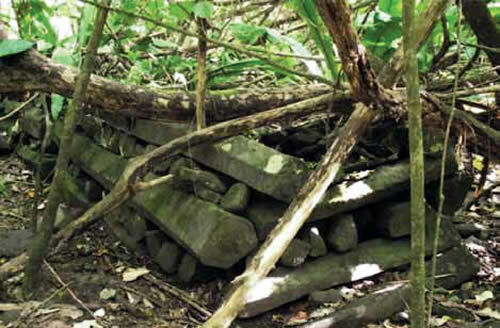 How did they build Nan Madol? The small islands were man-made. They were built with coral boulders then filled in with coral rubble and soil. But, how did they get the massive heavy stones in? Just one of the foundation cornerstones is estimated to weigh 50 tons. The canals are shallow. A raft would sink to the bottom under that much weight. The closest place where this basalt could have come from is miles away. One legend says that two brothers, Olisihpa and Olosohpa, were given magical power to fly the columns with help from a dragon. The legend says that Olosohpa later married a native. Their descendants at first ruled benevolently as the Saudeleur clan. Later, the Isokelekel invaded and ruled from Nan Madol. It is said they are the clan that inexplicably abandoned the capital. 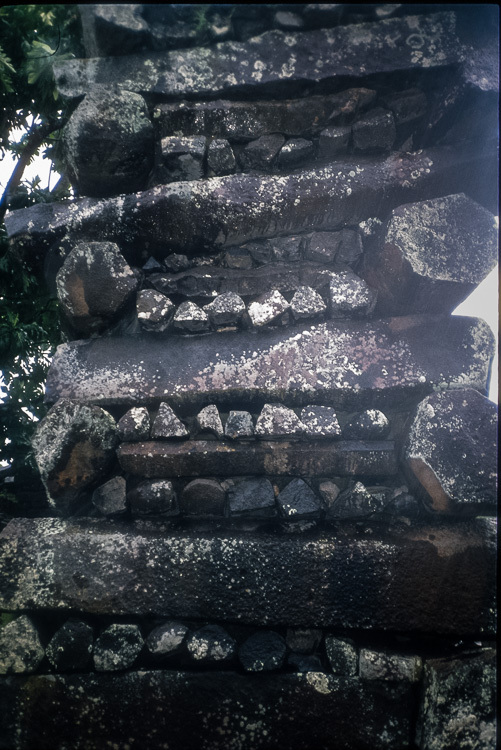 Another legend has it that Pohnpei once had an advanced society that knew how to control sound waves to levitate the huge columns. 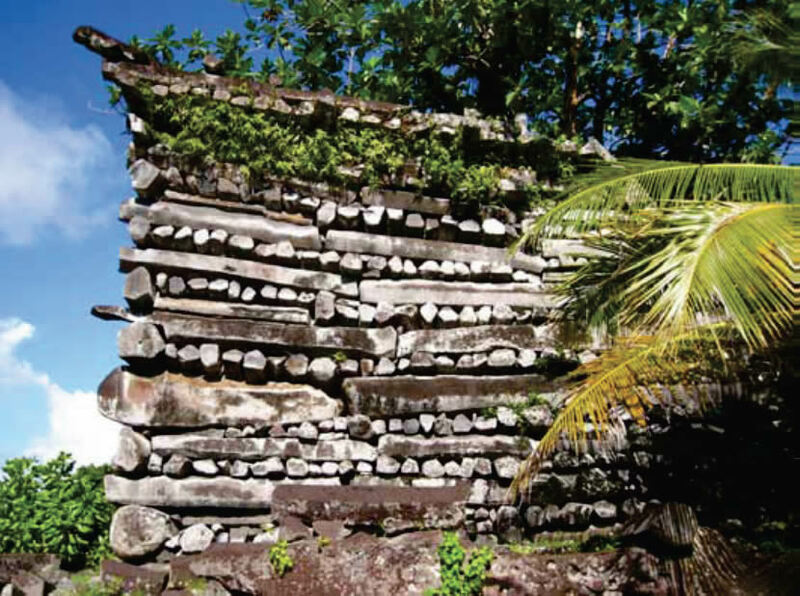 Archeologists have found evidence that Nan Madol was built over centuries. It seems the main island was inhabited as far back as the first century. They started building artificial islands artificial islets—stone and coral fill platforms by the eighth century. And sometime around the late 1100s they started bringing in the massive columns. Nan Madol was the capital of the Saudeleur Dynasty. 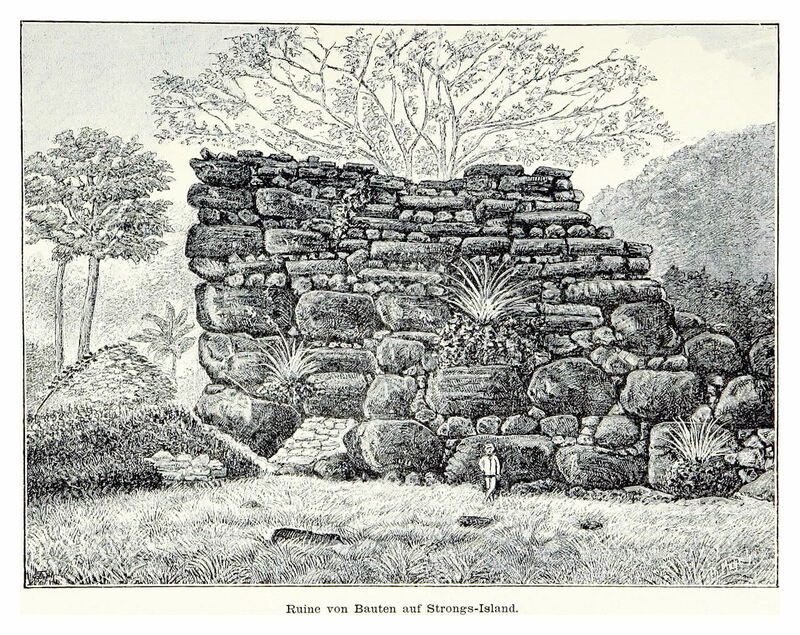 The Saudeleur Dynasty united the people of Pohnpei , estimated some 25,000 people, until about 1628. Archeologists believe that palm tree inclines were built to laboriously hoist the stones into position. 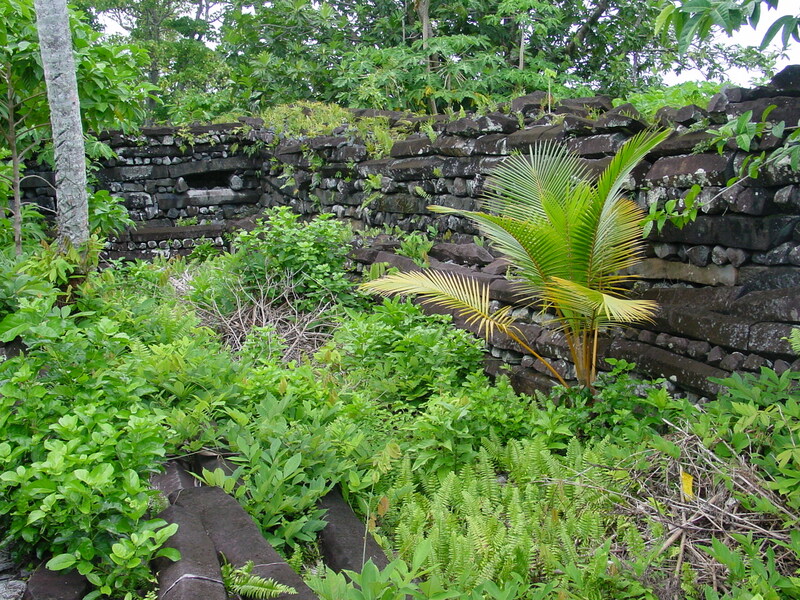 Local tradition claims that the builders of Leluh on Kosrae migrated to Pohnpei and they built Nan Madol. 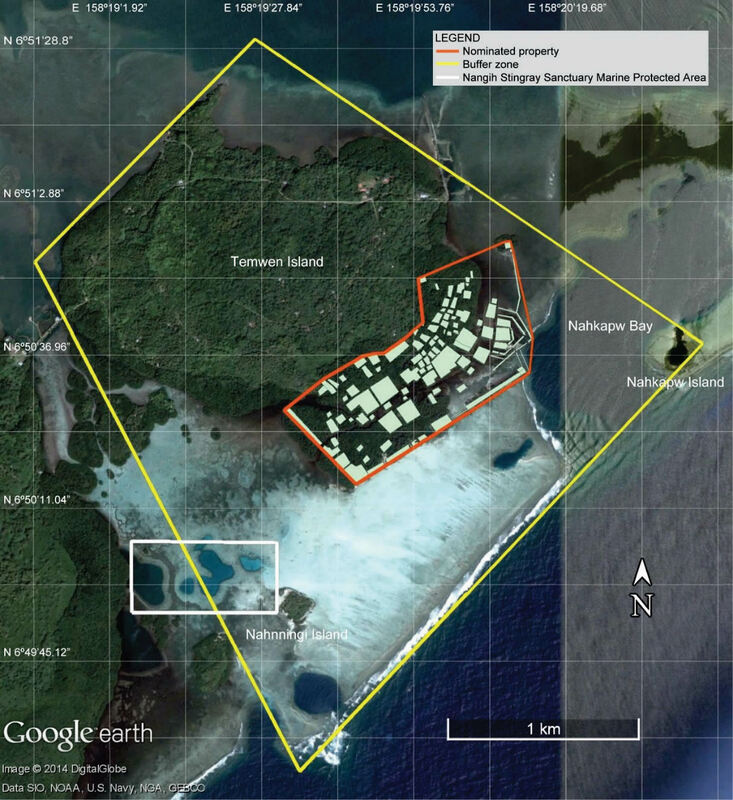 But, radiocarbon test indicate that Nan Madol is older than Leluh. 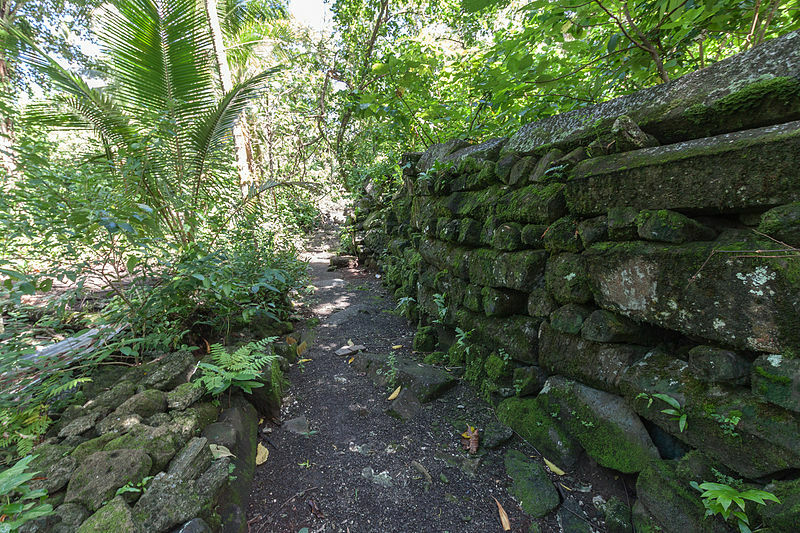 Was Nan Madol conquered? Did disease or a typhoon wipe them out? Did something affect the food supply? Nothing grows on Nan Madol and there is no fresh water. Everything must be brought in. It seems that no more than 500 to 1000 people ever lived here. Why were the islands abandoned? We’ll probably never know. 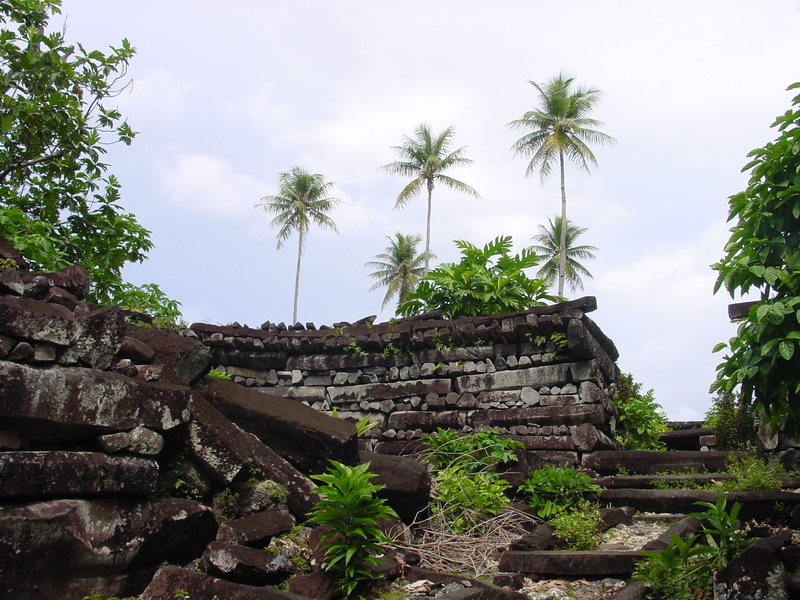 It had been deserted well before the first Europeans saw the Mystery of Nan Madol. 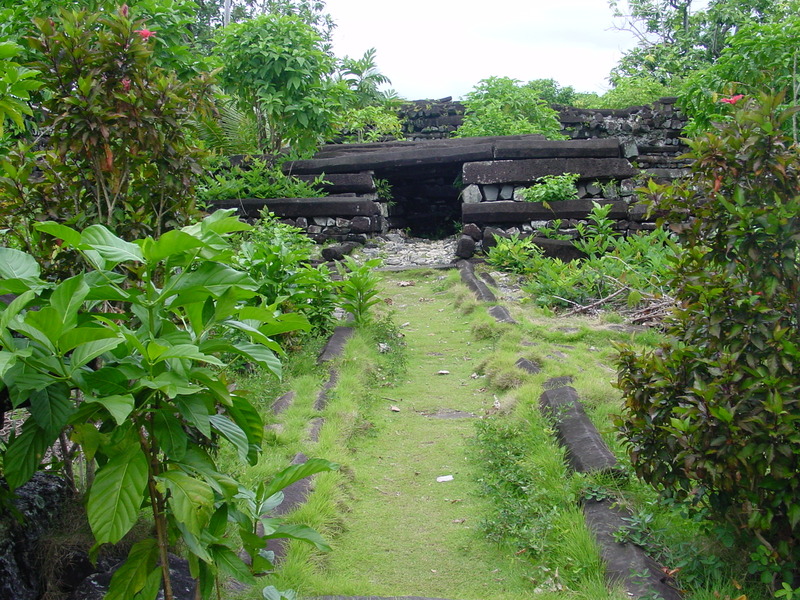 Nan Madol archaeological district covers more than 4448 acres. It includes the stone architecture, the Temwen Island coral reef and artificial islands and the Pohnpei main island coastline. The main site is along the shore and the adjacent land. The site core with its stone walls encloses an area nearly a mile long by 1/3 mile wide with nearly 100 artificial small islands bordered by tidal canals.